We all get cravings right? Well, I have had this rich yummy goodness on my mind for forever! I am telling you it is evil... and I mean that in a good way. My mother-in-law made this a few years back for Thanksgiving and I have wanted to make it ever since. It is perfect because I am not a huge pie fan. 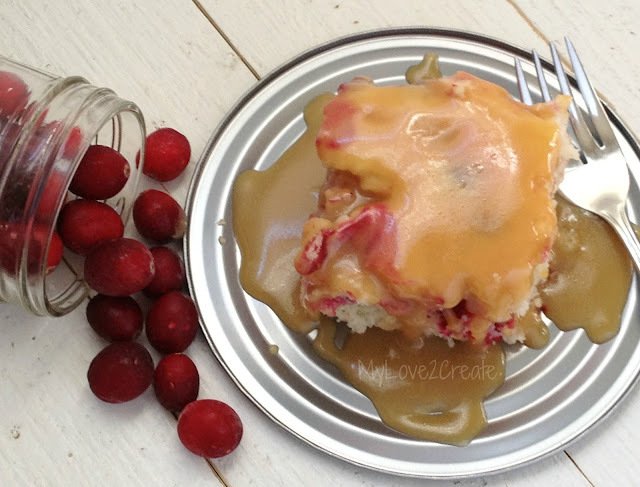 I got the recipe about a year ago and couldn't find any fresh cranberries at the store, aghhh! A few months ago I spotted a bag in Costco and they have been patiently waiting in my freezer ever since. On Sunday the wait was finally over and I made it for the first time! Actually it was a joint effort, my kids and I made it together. Sorry no in-process pictures, we were having too much fun. It is super simple and super rich and super bad for you, but hey we are indulging right!? I would say this is great for a party, it is simple to make yet seems very fancy! Cake: Mix dry ingredients. Add mild and butter. Stir in cranberries just until coated. Pour into greased 9x13 inch pan. Bake at 375* for 45 to 50 minutes. Sauce: Melt butter, Mix in rest. Bring to a boil. Reduce heat and continue cooking for 10 minutes to thicken. Serve warm over pieces of cake and top with whipped cream or Cool Whip. I didn't have whipping cream or cool whip and it still tasted great, but I can imagine how delicious it would be with it! I am so hungry now!!! This looks insanely amazing! You see I love cranberries and then with the sauce!!! Oh My!!! Pinning!!! New GFC follower here from Meet & Greet [finally] following you back and loving this very first post I'm seeing. =0) Oh, yes, I pinned it! This looks so good!!!! Especially drizzled with the sauce!!!!! OMG! #1 I have cranberries in the freezer. #2 this recipe is egg-free, so no science experiment type adaptions needed. Thank you so much for sharing! My family is going to love it. 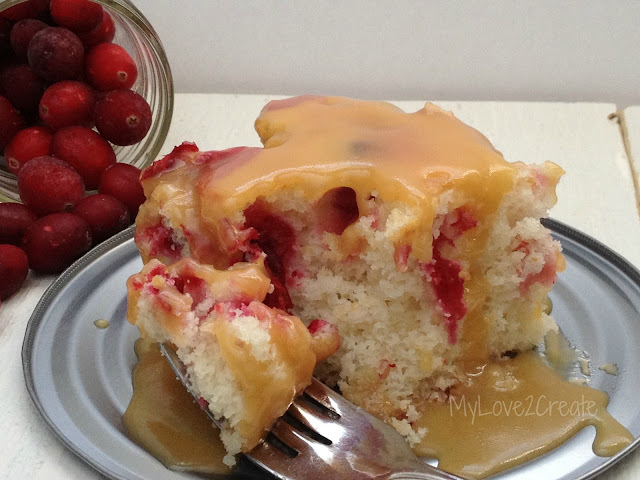 Now...I am dreaming of this yummy looking cake...cranberries and caramel are two of my favs. Thanks for sharing it at my party. This looks yummy...and pretty picture! Wish I had some cranberries in the freezer! For a guest post...anything! Craft, recipe, something to do with kids...anything you want! Let me know! thanks! Drop by on Monday and grab my featured button for your blog (it's located under my header). Yes...you will be featured at NTT. Oh that caramel sauce is calling my name. When we most recently made it, we used our homemade vanilla--made with some really nice rum--in the sauce and it was amazing! 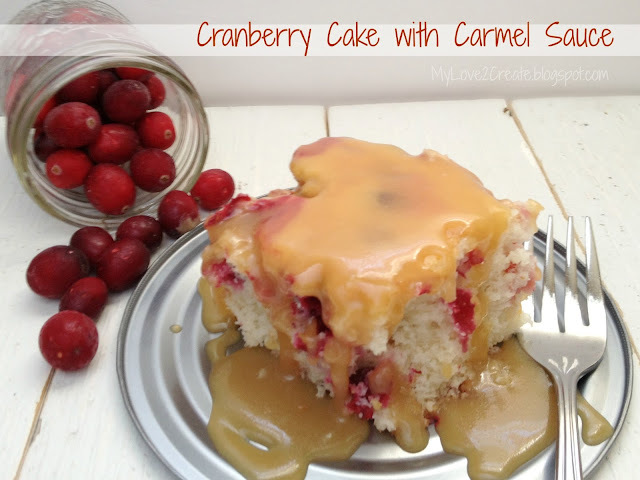 The caramel sauce looks so sweet. I have saved your recipe and will try to make them for my kids. Thank you so much ! This looks so yummy: the cake and the sauce. I can hear it calling my name. Can't wait to try it. Thank you so much for posting this! This look so good, I wouldn’t want to stop eating!!! This looks absolutely amazing. I will most definitely have to give this a try. My kids will love it. Caramel looks so yummy. Ce regard si bien, je ne voudrais pas arrêter de manger !!! - This cake look sweet and delicious. I will try it soon. This looks delicious! The next time we have guests over, this will definitely be on the menu! Awesome! I hope you love it as much as I do!